An elderly sweetgrass basketmaker is shoved from her home and her way of life by a town’s progress. A scorned woman seeks revenge on her boyfriend with a credit card and a bottle of mustard. A forgotten young girl tries to find her way in the world with only her wits and her grandmother’s sewing machine. A truck stop waitress has a grim secret that will make you die . . . laughing. This collection of short stories offers something to entertain you, no matter your mood. Societal changes, injustices and brokenness provide windows into the human spirit and its situation, whether ugly, beautiful, desperate or hopeful. Some characters rely on faith or love to see them through. Others seek revenge, often with humorous results. Check out my blog at www.perrincothranconrad.blogspot.com for new short stories and other samples of fiction, or for a little slice of my personal life. Check here for more events in the future. Author Perrin Cothran Conrad lives in Summerville, South Carolina with her husband and son. A former real estate attorney, she became a statistic in the unemployment crisis. After a fruitless job search, Perrin decided to follow her dreams. She now devotes herself to her family and her writing. Since her days as an English Literature/Creative Writing major at Agnes Scott College, Perrin has known that God's purpose for her life was to write. She has worked as both a magazine columnist and a Freelance Commercial Writer. She published her first book, A Quiet Cup of Tea, not long after the birth of her son. 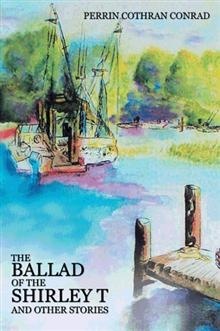 The Ballad of the Shirley T and Other Stories was released in October, 2011. Perrin still writes short stories regularly and is currently working on a novel. Perrin's first release, A Quiet Cup of Tea, is a gift book that celebrates the pleasures and benefits of tea. The short story within describes one day in the life of a lady whose attempts at having a "quiet cup of tea" alone are constantly derailed by family, friends, life in general. At the end of the day, it causes her to reflect on her chosen priorities in life. The book also contains a brief history of tea in the United States, quotes and poems related to tea, and a few teatime recipes reprinted (with permission) from the cookbooks of The Junior League of Charleston, Inc. ( www.cookinginthesouth.com ) For information on purchasing it, please click on "Where to Buy" above. LATEST RELEASE: The Ballad of the Shirley T and Other Stories, a collection of short stories, is now available for purchase through iUniverse's online bookstore. Click here to find it: http://bookstore.iuniverse.com/Products/SKU-000489917/The-Ballad-of-the-Shirley-T-and-Other-Stories.aspx $8.95 for paperback and $3.99 for e-book. COPYWRITING CLIENTS, PLEASE CLICK HERE.